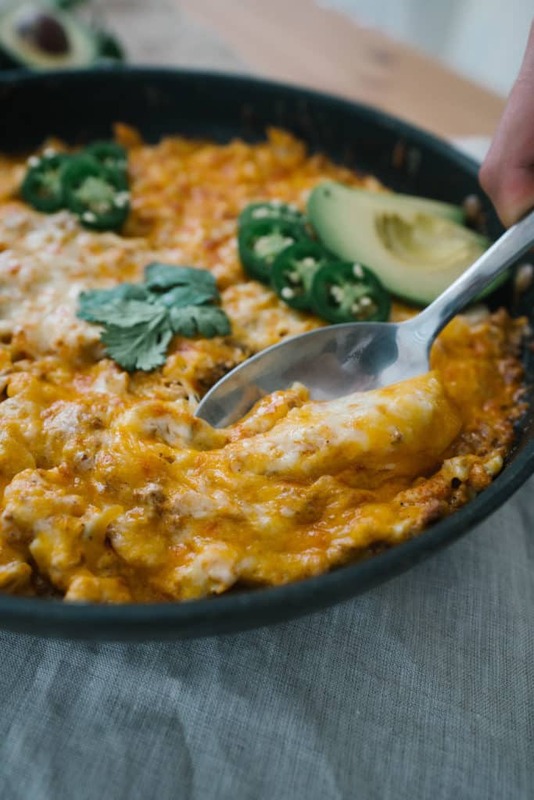 You can never have enough dips, appetizers or one skillet meals and this Chorizo Dip checks all three boxes! It's packed with flavor and filling ingredients from the spicy chorizo to the hearty cauliflower. This meal is perfect for non-keto family members, busy nights or when you're in need for a comforting, delicious meal. Watch me make it below and throw your own twist on it when you make it for your family. Options for dip ingredients are honestly limitless and you can never go wrong with something cheesy, creamy, spicy or flavorful! As long as you're not scared of a little flavor you will love this dish! And if you are feel free to make a side plate filled with toppings for friends and family to enjoy while you keep it simple with the chorizo, cauliflower and cheese combination. Serve it with some veggies, pork rinds and flackers and you are good to go! Our Favorite One Skillet Meals! As of late, we have been meal prepping a lot more due to travels and hectic schedules. While we prefer to cook every meal if possible sometimes we just need something quick, delicious and macro friendly to whip up for a couple days to a week, and this is the perfect recipe. It has fatty chorizo, hearty cauliflower, and creamy, delicious cheese! It also takes under 15 minutes to make and is really easy clean up. Some of our other favorite one skillet is keto egg roll in a bowl and our chili with bacon! All the recipes we make and share with you are highly customizable to your and your families taste preference. I would personally swap out the cauliflower for broccoli since cauliflower causes me to bloat and I would definitely add in some onion and bacon to top. You could technically take this one meal and make a simple change each time turning it into an entirely new chorizo dip for your family to enjoy! 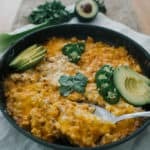 Recipe can be quickly added to MyFitnessPal - Search "KetoConnect - Chorizo Dip"
Heat a large, oven-safe skillet to medium high heat and crumble the chorizo into the hot skillet. Break it apart using a spatula to brown all over. Once the meat is cooked down add in the onion and cauliflower. Once the cauliflower and onions are tender, add in the cream cheese and sour cream. Combine using a spatula. 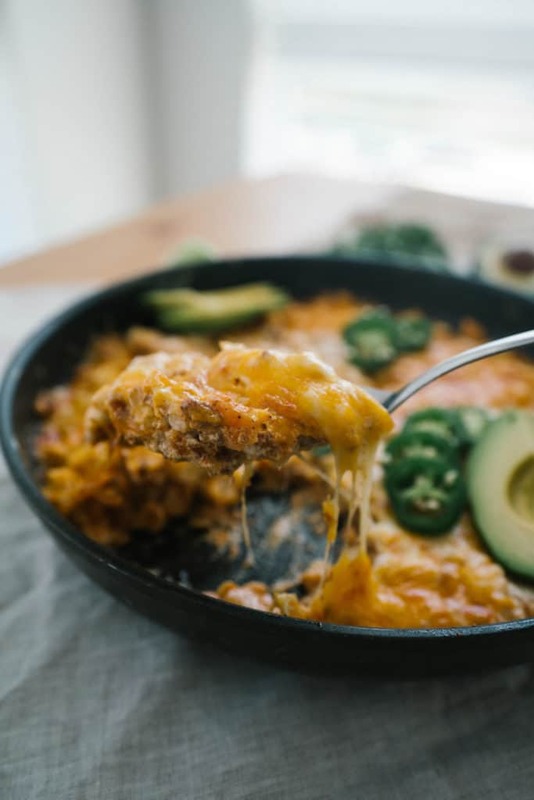 Remove skillet from heat and top with cheese. Turn your oven to broil and place the skillet in the oven for 1-2 minutes until the cheese has melted to your liking. Optionally, top with avocado, sour cream and jalapenos and serve warm with pork rinds or veggies as an appetizer or for dinner. Enjoy!